A carte-de-visite portrait of Captain Henry Frederick Rowley (1839-1874), who served firstly with the 79th Highlanders (the Queen’s Own Cameron Highlanders) and then with the 78th Highlanders (the Ross-shire Buffs). Born on 22 March 1839 at Weeting Hall in Norfolk, he was the fifth son of Captain Richard Freeman Rowley of the Royal Navy and his wife Elizabeth Julia née Angerstein, daughter of John Angerstein, the MP for Blackheath. His paternal grandfather was Admiral Sir Charles Rowley. 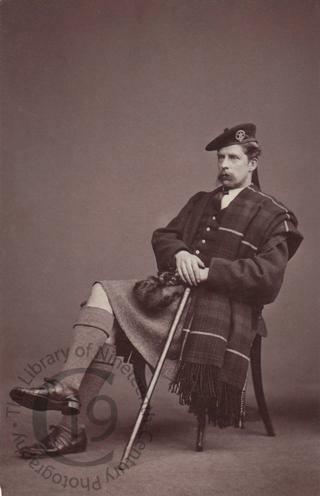 Following his education at Harrow and at Magdalene College, Cambridge, he joined the 79th Highlanders as an Ensign in April 1861. While serving in India with that regiment he became seriously ill. His condition was diagnosed as ‘Chronic hepatitis and enlargement of the liver’ and he was invalided home. While in England he became a Lieutenant (by purchase) on 26 May 1865 but exchanged into the 78th Highlanders on 22 August 1865. He served with his new regiment in Canada at Montreal and at Halifax from May 1869 until September 1870. On 27 February 1870 in Surrey he married Eveline Rebecca Louisa Noad, second daughter of Innes Noad of Fan Court at Lyne in Surrey and he sold out of the army two months later. The couple appear on the 1871 census living at Highfield Hall near Smallford in Hertfordshire. The marriage produced no children. Captain Rowley died on 8 April 1874, aged 35, at 11 Westgate Terrace in Kensington. The cause of his death was presumably the liver disease he had contracted while serving in India. He left an estate valued at £12,000. Photographed by Alexander Crowe of Stirling in Scotland.